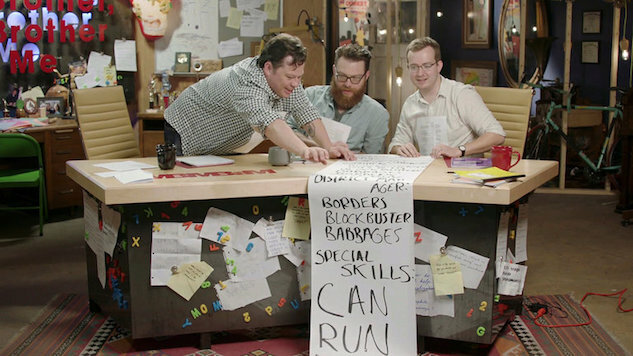 There are three McElroy Brothers, or at least three you need to know about right now. Their names, in the order they emerged into this world, are Justin, Travis and Griffin. Travis is the one with the beard; Justin and Griffin are the other two. They are the hosts of the podcast My Brother, My Brother and Me and, in various permutations alongside their spouses and friends, a sprawling network of other podcasts: The Adventure Zone, Shmanners, Sawbones, Rose Buddies and the tremendously titled Til Death Do Us Blart. They are also the creators and stars of Seeso’s new unscripted comedy series My Brother, My Brother and Me, a loose and limber adaptation of their flagship podcast, which premieres on the streaming platform today. In the tradition of creator-driven episodic realityish comedies like Nathan For You and Billy on the Street, My Brother, My Brother and Me is what the Brothers describe as a comedy advice show. As in the podcast, which over seven years has amassed more than 300 episodes, they take audience-submitted queries and riff their way to a solution. In half-hour episodes, this usually requires setting some outlandish goal peripherally related to the inciting question: changing the national conversation around tarantulas to help a guy whose partner doesn’t want him to adopt a tarantula, for instance, or padding their résumés with a litany of odd jobs to prove to a job-seeker that it is possible, nay, easy to pad one’s résumé (if you have a TV crew). The series is set in their hometown of Huntington, where at the end of most episodes they reconnoiter with their father, a local radio host, to unpack the day’s adventures. It’s goofy and imaginative, filled with meta-humor and star wipes, hijinks and locals glancing bemusedly at the camera. Also, Lin-Manuel Miranda guest stars. As it does in Nathan For You, the improvisatory approach also results in (metaphorical) heaps of unused footage. “We filmed 20 hours for each episode and then used, you know, 25 minutes of footage,” said Travis. “We were really learning how to ride a bike. It makes you feel like a child, sometimes.” Of course, that childlike feeling—of discovering what a thing fundamentally is as you’re making it, or in our case consuming it—is precisely what makes My Brother, like their podcasts, so delightful. The humor comes less from mathematical punchlines and joke-escalations than from the Brothers’ individual and collective personalities, the narrative flights of fancy they dream up (like a spider parade) and the obstacles they run up against (like only having a minute to enact city reforms), their refusal to even pretend that they know how to make a conventional show. It is, as Travis proclaimed, a “goulash” of every show that has ever influenced them—from TGIF to MST3k—channeled through their distinct chorus of voices. “One of the things we talked about was Peewee’s Playhouse,” Travis said. “That idea of, ‘In this room, your weirdness is normal. This is the place where we all hang out and be kind of silly and dumb for a half hour.’” In My Brother, My Brother and Me that place is Huntington, West Virginia: Cabell County seat, home of the regionally-famous Big Sandy Superstore Arena, site of the world’s first tarantula parade. Also, Lin-Manuel Miranda guest stars. My Brother, My Brother and Me is now streaming on Seeso.